Travel at its truest is thus an ironic experience, and the best travelers seem to be those able to hold two or three inconsistent ideas in their minds at the same time, or able to regard themselves as at once serious persons and clowns. 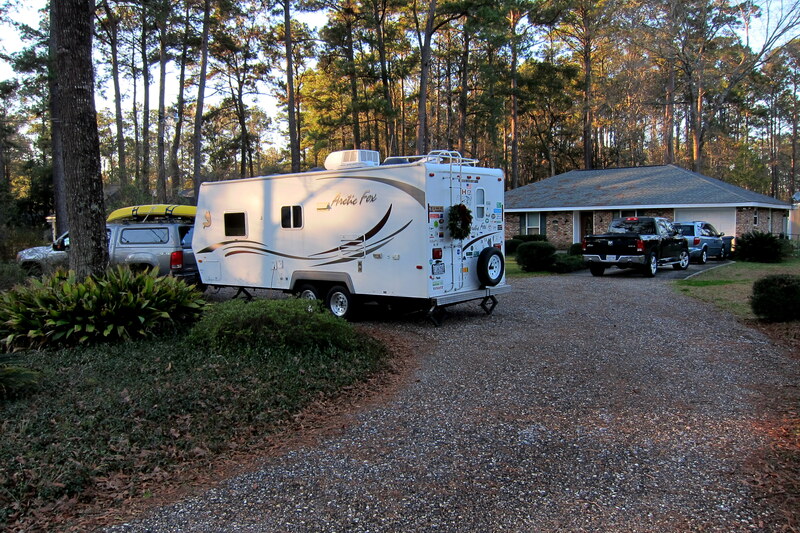 Wednesday, January 16, 2013: Up and sadly left Oak Grove Campground on the shores of Pensacola Bay. Starting today we head pretty much due west for the next month or so…..or until Lucille guides us into the Pacific Ocean. The morning is warm, overcast and a bit drizzly…..great weather to be cooped up in a truck and making miles. A cold front is coming into the Florida panhandle so it is also a great day to leave the beach. I noticed on my morning walk that the temperature seemed to have dropped some 15 degrees since sunrise. At 0900, as we pulled out of the campground, it was a cool 59 degrees and a steady rain was falling. 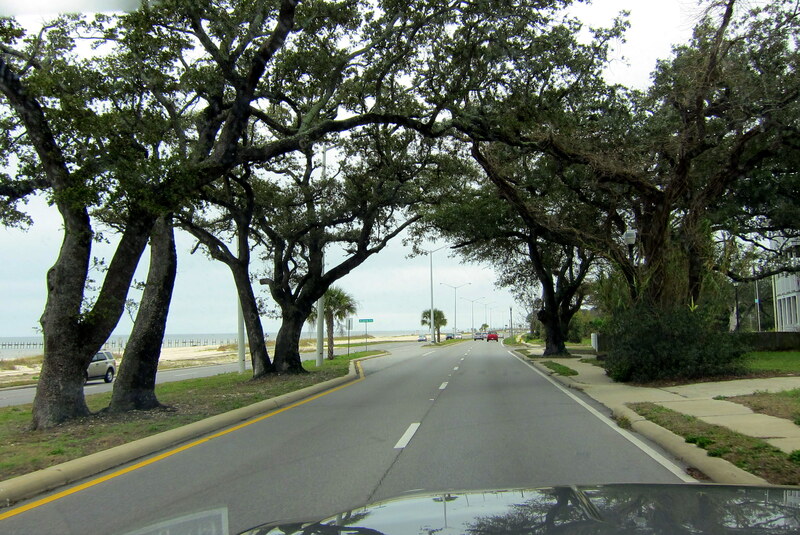 Piecing together a variety of back roads that kept the trucks compass on the “W”, we soon passed through the schizophrenic village of Florabama as we once again entered LA…..which stands for “Lower Alabama” in these parts. Cruising on US-59W we noticed a sign for a Camping World store and made a stop to see if there were any “can’t live without” items that we have been living without over the past five years. Kit and I have been thinking of a bathroom remodel, so since a Jacuzzi garden tub is out of the question, we checked out some fancy commodes. Had an interesting conversation with a sales clerk about the advantages of upgrading to a porcelain unit. He was quite knowledgeable…..he was definitely number one in the number two business! Back on US-59 we jumped up to I-10 in order to roll through Mobile, Alabama before dropping back down to US-90 to continue our trek along the Mississippi Gulf Coast. Passing through my old haunts of Pascagoula and Gautier, Mississippi. I was a bit surprised that little had changed, considering that hurricane Katrina had devastated this area pretty bad. In fact The Bamboo Lounge, better known as the Aegis Test Team Field Office, was in its original location but renamed Just One More. The attached trailer park where I lived for three months in 1987 is long gone. 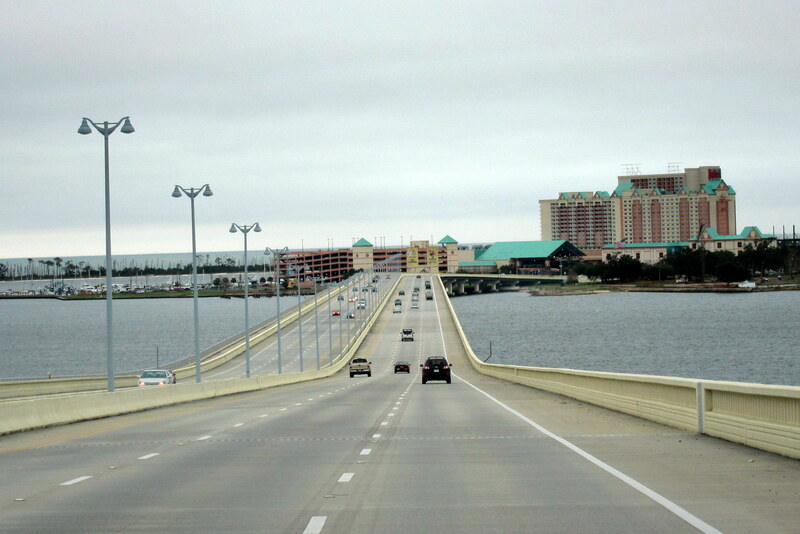 Continuing west on US-90, we noticed the new bridge over Biloxi Bay provides a nice gateway to the gambling resort area. 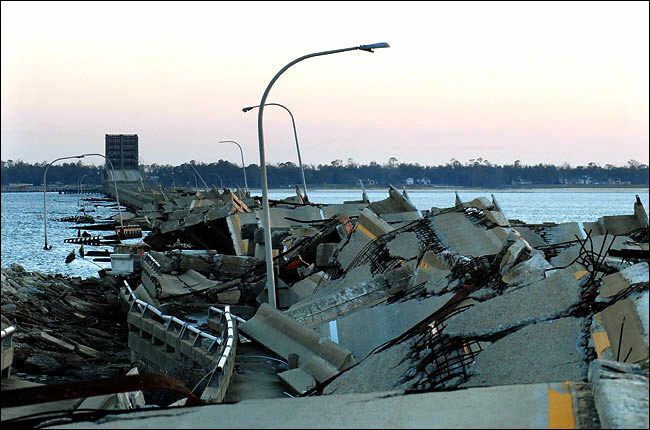 The original bridge was destroyed by Hurricane Katrina back in August 2005 as chronicled by the following news photo. The gambling resorts of Biloxi and Gulfport are the economic life blood of southern Mississippi. 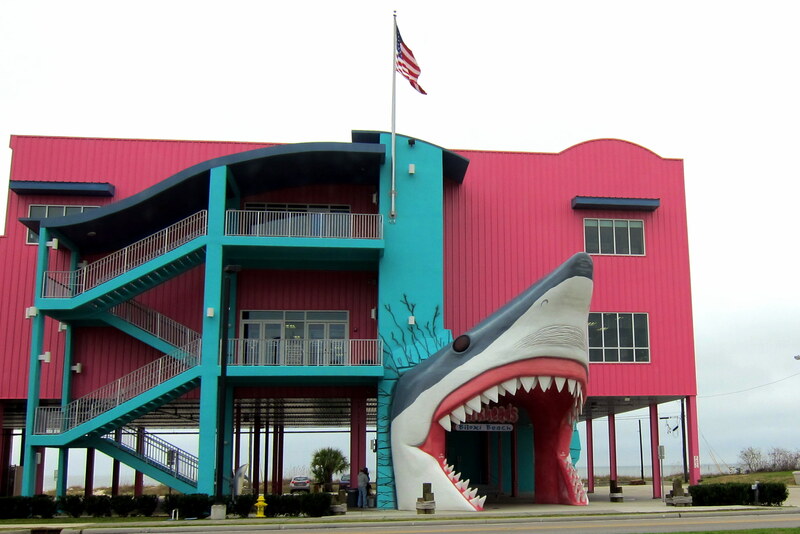 And as such the area was quickly rebuilt…..even the world famous Sharkheads tourist trap was built anew, right on its original vulnerable location. It always amuses me that the merchandise one finds after entering through a gift shops fake animal mouth is representative of what emanates from an actual animals tail. At least the Beijing owners had the sense to put their valuable merchandise in a building on stilts (yea, I know I’m China bashing this trip). Stopping for a quick lunch we happened upon this interesting fellow. 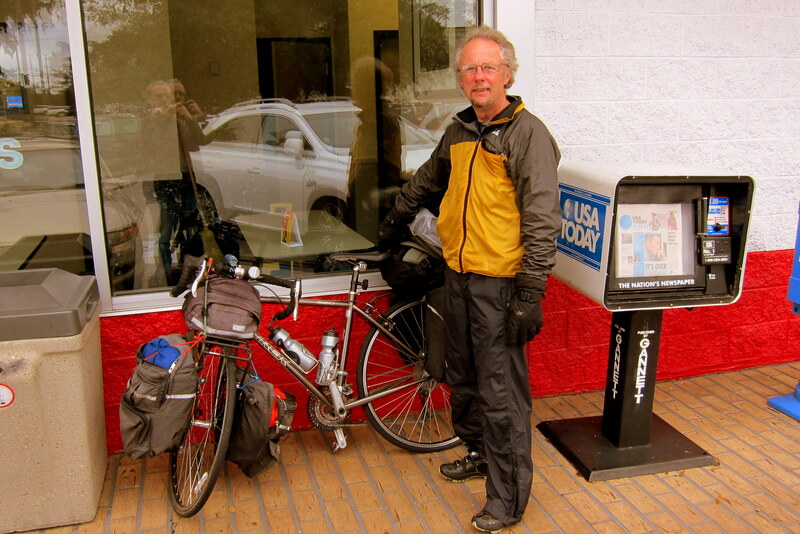 A cycling tourist from Connecticut, he had been on the road since March of last year. He has seen a large part of America up close and personal from the seat of his 27 speed, Trek 520…..a classic touring bike. Said he hoped to get back home by this March. His biggest challenge? Road debris…..he has gone through countless inner tubes and tires. It seems a lot of US automobiles are losing a lot of sharp and rusty components that get bounced to the shoulder of the highways. Being on our preferred back-road route, the drive was a bit slow but far more interesting and picturesque than hurdling down I-10 which is a few short miles to the north. Around 1500 we pulled into Covington, Louisiana and stopped at the home of our oldest Navy friends, Johnny and Eileen. We all met as teenagers back in 1965 while stationed in Key West, Florida and were neighbors for over a year. Although we stayed in touch we only had sporadic contact until five years ago when we visited them on our first Excellent Adventure. We have visited nearly every year since and a few years ago they came to Maine to visit us. Offering up their dooryard for a few days of freebie camping, we gratefully accepted the kind gesture. 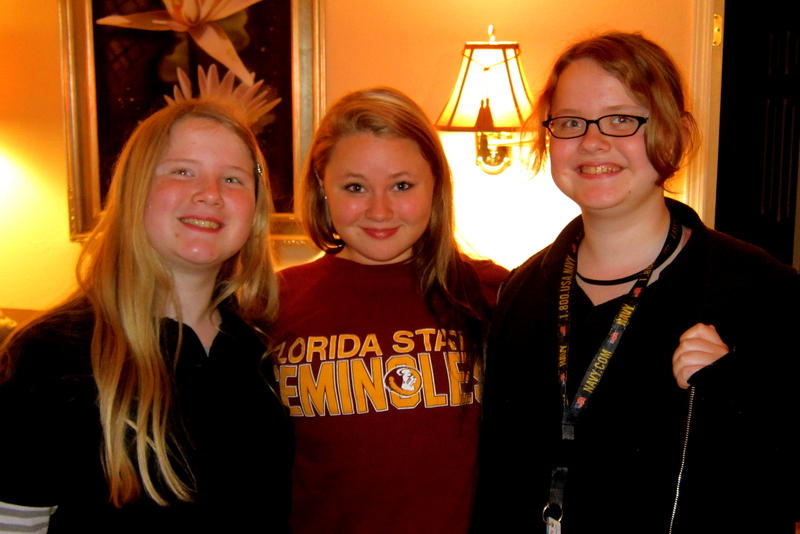 That evening, Eileen made an incredible Louisiana feast of Jambalaya and French Bread which we shared with their delightful granddaughters, Katelyn, Shelby and Gracen. 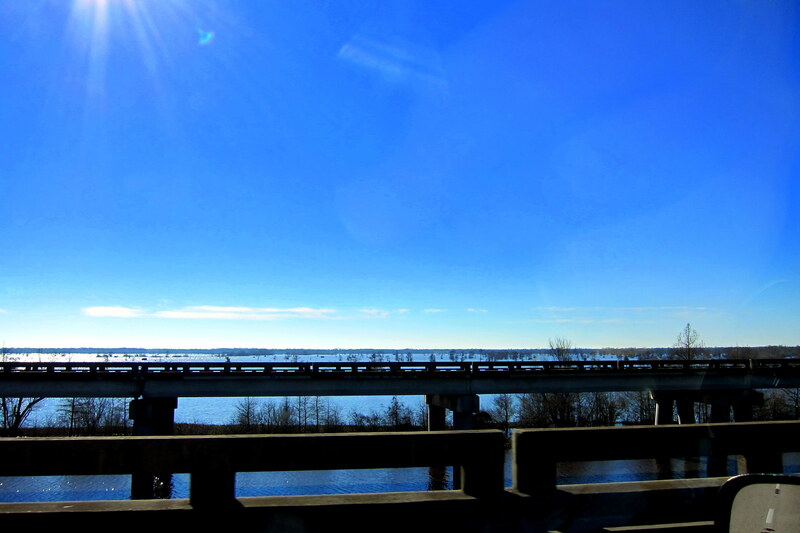 Thursday, January 17, 2013-Covington, LA: A beautiful “Visitors Bureau” day in Louisiana. We spent it with Johnnie and Eileen, catching up on each other’s lives and reminiscing about the early days in Key West. 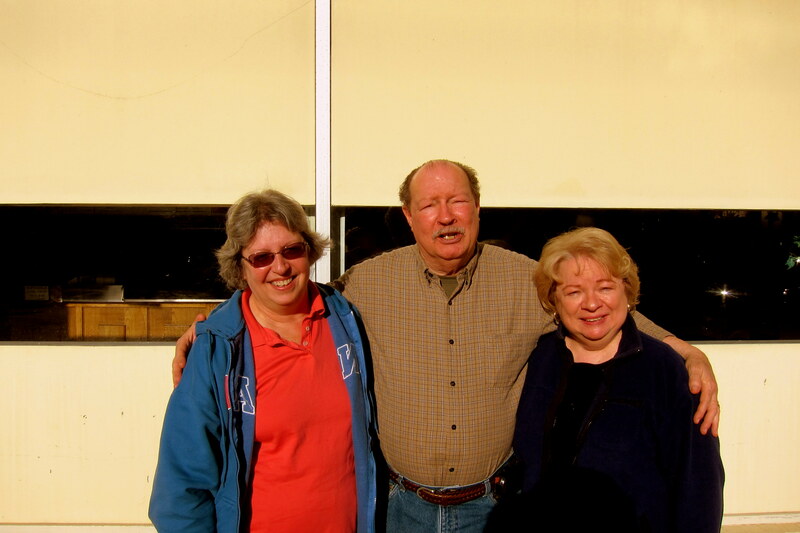 As is customary when we enjoy the hospitality of friends we stop to visit along our travels, we treated Johnnie and Eileen to a meal at one of their favorite restaurants. 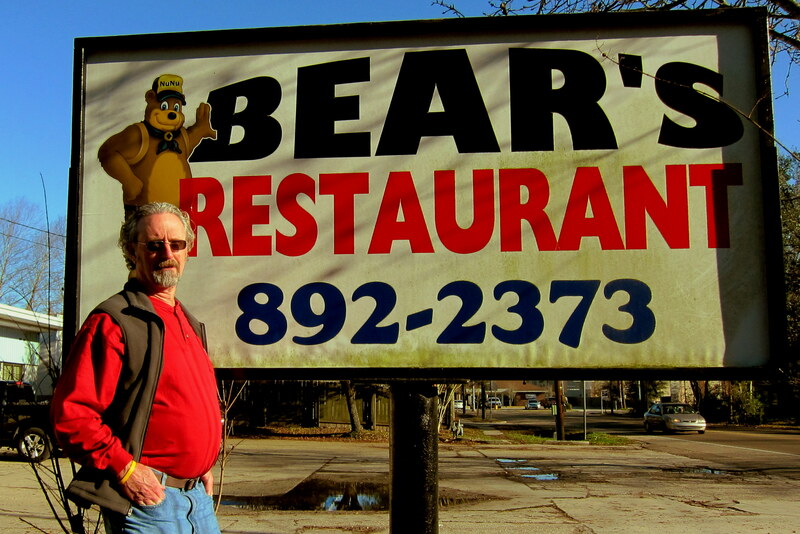 Bear’s Restaurant is a small non-descript eatery off a busy side street that likely has the best Po-Boys on the planet! PO-Boy’s are Louisiana Sub Sandwiches, Italian’s, or Hogies……but bigger and better, or so they say……and from what we experienced today, I’d say they might be right! The term Po-Boy came about in the 1920’s while during a labor strike by street car workers in New Orleans, the out of work strikers stopped buying lunch at Clovis Martins restaurant. So old Clovis piled a bunch of fried oysters and shrimp on a baguette and handed them out, free of charge, to his former patrons. 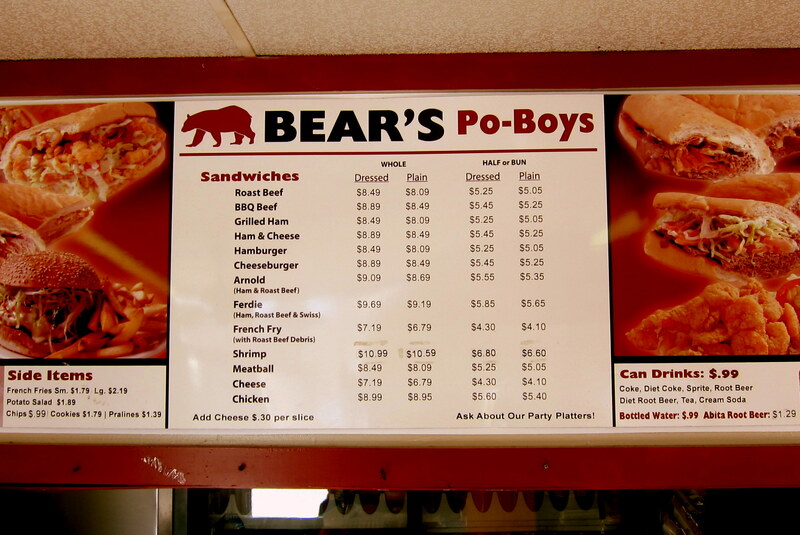 The cooks in his restaurant started referring to the sandwiches as oyster loaves for the poor boys…..in Louisiana dialect this was naturally shortened to Po-Boy. 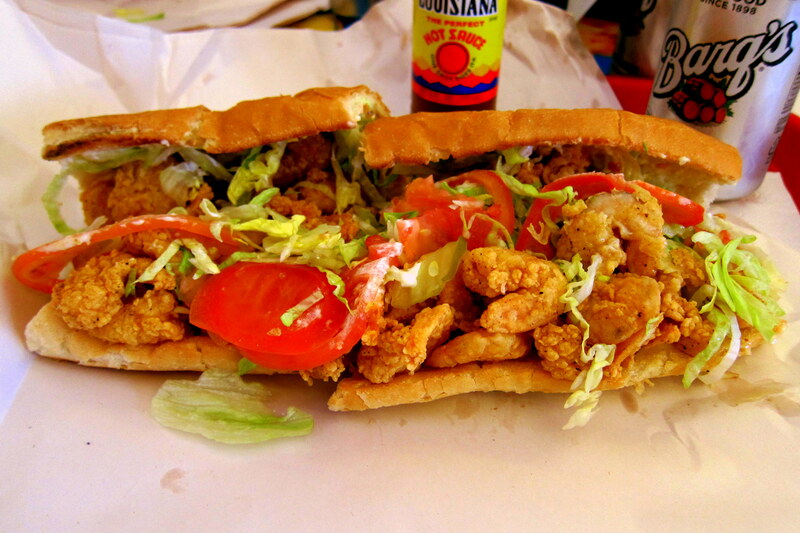 That’s a Shrimp Po-Boy we each enjoyed and it came loaded! As were the diners!! But not nearly as loaded as this writer!!! I fully intended to eat only half of that huge sandwich and save the rest for later…..then, next thing I knew it was gone! So much for good intentions!! If that wasn’t enough caloric intake, our hosts insisted we sample some traditional New Orleans King Cake. Some good and some rich. 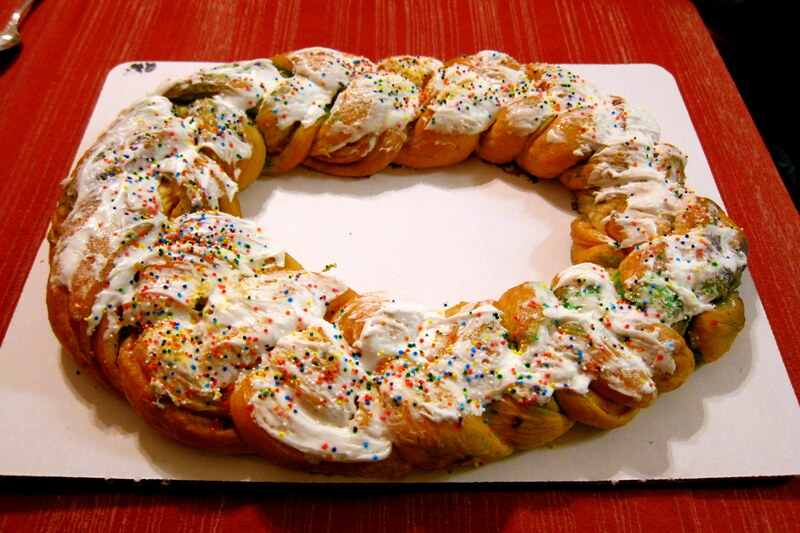 It was so large that there was actually a baby hiding inside…..honest, don’t believe it, then Google “King Cake”! 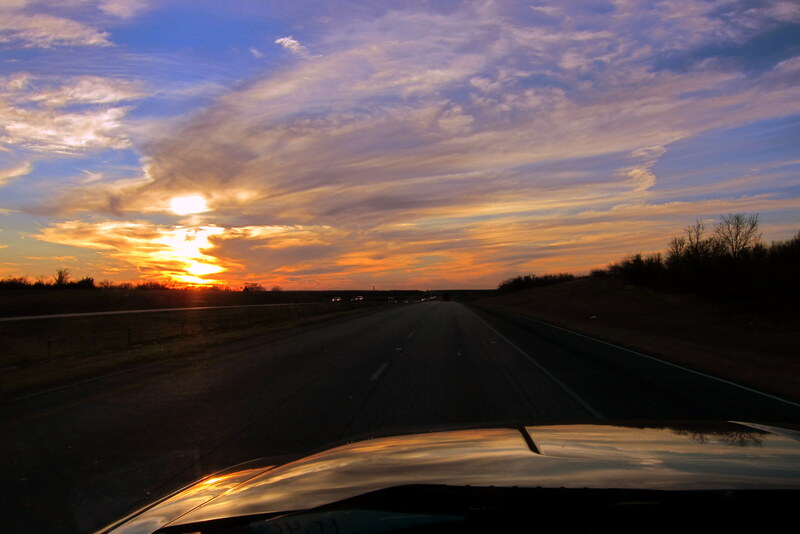 Thursday, January 17, 2013: Up early and on the road. Sunny skies, temperature of 35 degrees and no wind…..ah, just like a summer morning in Maine. 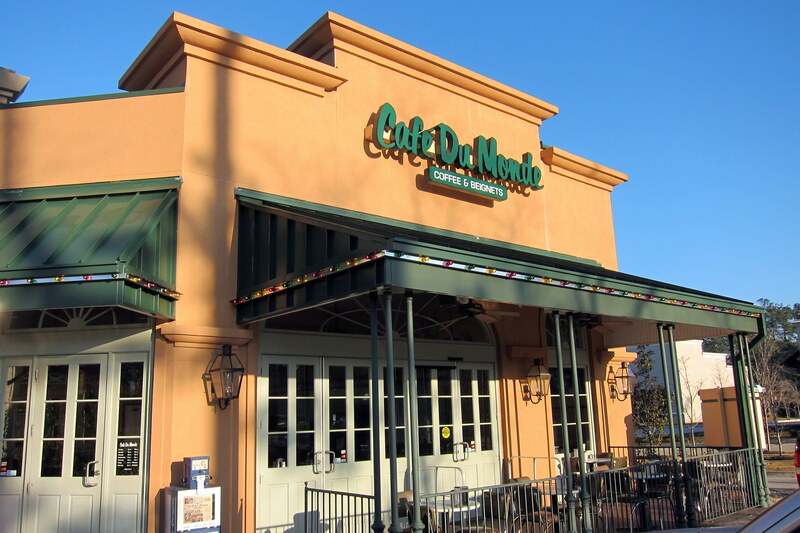 On the way out of Johnnie and Eileen’s neighborhood we came upon a Café Du Monde…..yep the same folks that provide the perfect morning hangover remedy down in the French Quarter now have satellite locations. I think I really made an impression on the young Cajun lass when I ordered some of “dem dar big nets”. So we enjoyed a few Beignet’s chased by chicory coffee and we were wired for the mornings drive. To escape the madness of rush hour traffic, we jumped on I-12 which then merged with I-10 heading west. It didn’t work…..it was congested and crazy. I often wonder why folks commuting to work speed. Going home, I guess I can understand it. Within an hour we crossed the Mississippi River and were officially in the Wild West. This was further verified as we crossed into Texas three hours later and strapped on our six shooters. Hey…..six rounds in a Texas revolver, six targets in a pack of beer…..coincidence? I think not! Since we have explored this particular Louisiana-Texas corridor during the past four Excellent Adventure trips, and since we wanted to make Kyle, Texas by nightfall, we stayed on I-10 to maximize the daily mileage. 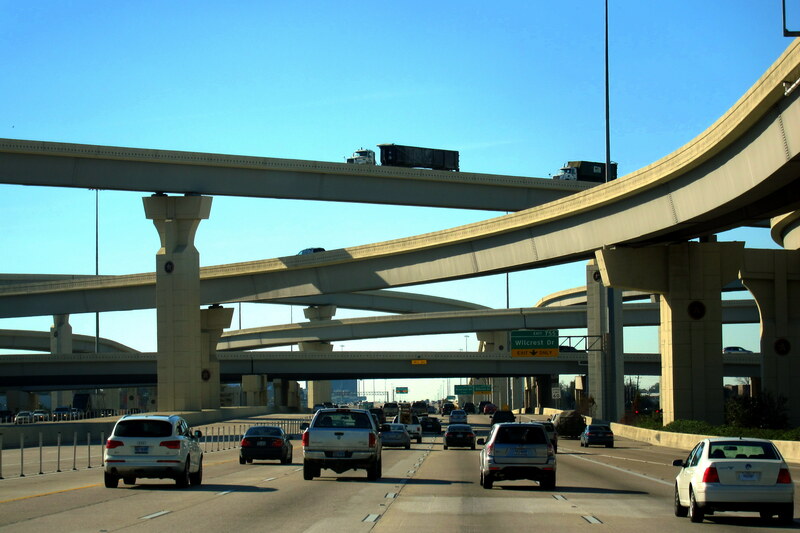 As we entered the Houston megalopolis area we were confronted by this massive and confusing structure. Yikes! It is midafternoon on a weekday and all these folks were going somewhere very fast. That’s a five layer traffic cake…..unbelievable! The problem with heading west late into the day is that you’re staring into the sun…..the advantage to traveling west late into the day is that you’re enjoying a spectacular sunset…..kind of a cup half empty/cup half full thing! Nearing San Antonio we escaped I-10 and took a variety of back roads toward Kyle, which is a neat little Texas town just south of Austin where Kit’s sister Charlotte and brother-in-law Donald were awaiting our arrival. Stay tuned for the next chapter of Bill and Kit’s Excellent Adventure, coming to a computer near you! Kit’s Corner: Well, I guess we have no more secrets. Leave it to Bill to blab to the world about looking for a new commode for the camper. I should have just ordered it on Amazon and be done with it. Of course, I would have had to scout out someone to install it but that’s not too hard. I seem to be losing my independent Navy Wife ways of getting things done on the sly. I am looking forward to a nice visit with my sister while Bill and Donald entertain each other for a few days. Well, this episode of your excellent adventure has touched on a few of my “favorite things”. First, we had a porcelain toilet in our motorhome and it was much better than all of the previous non-porcelain ones we have had. 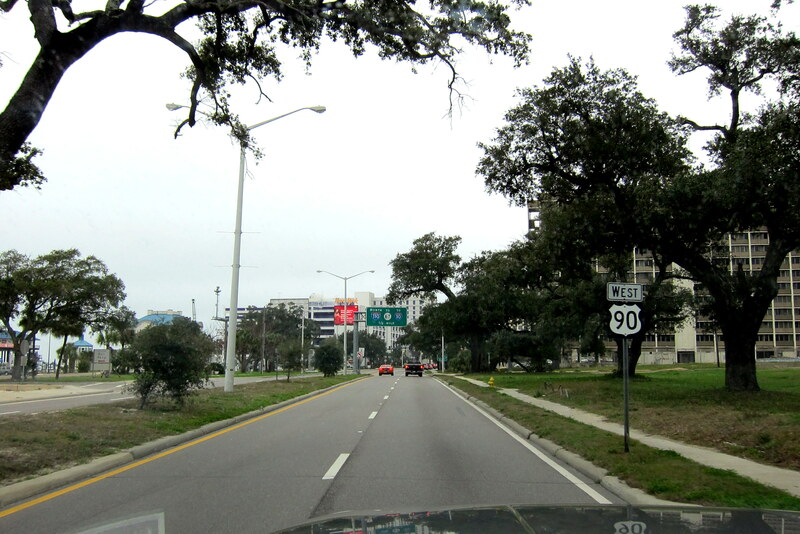 Secondly, I LOVE the Mississippi Gulf Coast and Rte 90, and thirdly, I also love Covington, LA because that’s where Barb and Harv went back to after Harv retired from the navy and we have visited several times…both before and after Barb’s death. All of these have brought back some wonderful memories! Thanks! Great to hear from you and glad you were able to take the trip down memory lane with us. Bill lived and worked in this area on and off for the 20 years before he retired. It’s always fun to visit…..on one of these trips we need to stay on the right side of the US and really rediscover all this area has to offer. Congratulations on your new Florida getaway! It looks and sounds perfect for you folks!! Take care of each other….love you guys! Enjoy your time in Texas but, the real fun is here in San Diego! I hope you make it this far this year. Thanks…..we did! And we fondly remember the “fun” we had growing up in San Diego back in the 50’s and 60’s. Regardless of where we live or where we travel, San Diego will always be our “hometown”! If we get anywhere near the southern left coast, we will looks you folks up. 12 DEGREES HERE IN BOWDOINHAM AS I TYPE. THIS HAS BEEN A WEEK OF HELLISH COLD. LAST SATURDAY JEANNE FLUSHED OUR PORCELAIN TOILET AND BINGO, NO AQUA. DUE TO SUB ZERO NIGHTS AND HIGH WINDS THE FROST HAD GOTTEN DOWN TO A POINT WHERE OUR WELL PUMP FROZE. SIR CHETTI LEAPED INTO ACTION AND WITHIN AN HOUR AFTER PLACING MY BUDDY HEATER DOWN IN THE WELL HOUSE, SHAZAM, WE HAD AQUA. BOTH JEANNE AND I ARE DOWN WITH COLDS WHICH PREVENTED A LUNCHEON WITH WINDY AND NAN WEDNESDAY. WE HAVE RESERVATIONS TO ESCAPE THIS ICE BOX FOR TWELVE DAYS STARTING ON 2/5. WE’LL BE STAYING IN MIAMI WITH FRIENDS IN THEIR NEW CONDO. HAVE A CRUISE OVER TO THE BAHAMAS ON THE SCHEDULE. STAY SAFE AND KEEP THE EX ADVENTURE UPDATES COMING. Hey, good morning old friend! Glad to hear from you and sorry you have been under the weather (pun intended). It was a rather cool 67 degrees here yesterday but we are heading further into the western desert today so the temperatures are sure to rise. oh by the way, Maine does not have agua…..Maine has eau! And when referring to toilet fluids eau is more appropriate to pronounce anyway! Glad you folks are going to find some Florida warmth, and that cruise sounds nice as well…..enjoy! We just love following you on this adventure! Can we just come along next time? This looks like so much fun! We love you guys and look forward to a longer visit next time! We are glad to have you along on our little adventure and you’re right, it is fun…..see what you have to look forward to in retirement? Love you guys as well and will certainly hang around the Huntsville area a few more days on the next time through…..thanks for being such great hosts! I finally have a chance to read up on you folk. Sounds like you are traveling well. I thought for a minute you were having a crappy time but I read on and all is well. Maine is still Maine in the winter if you don”t like it wait ahwile. Snowed last night and thirties today. Getting ready to head South not sure where yet. Keep a rolling along nice read.